The COM component is registered and does work to some degree as described above. I think Resharper is looking for the actual COM DLL file, but am not exactly sure. Additional note: in the Resharper options, it is specified to Run tests from: Project output folder, which is where the COM DLL and the .Net Interop DLL reside. Are you able to successfully run that test using the original NUnit GUI runner? file, but am not exactly sure. 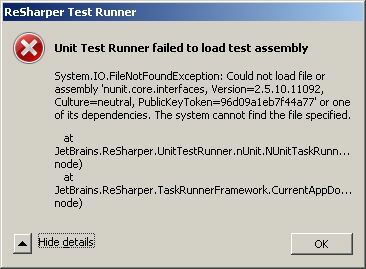 Hi Andrey, after some further testing, it appears that the NUnit GUI runner exhibits a similar behavior. However, I was able to resolve it by moving the NUnit GUI exe into my working directory and running it from there. I would rather not have to resort to using the NUnit GUI though, as we want to continually execute from within Visual Studio. Is anyone else trying to run unit tests that make use of COM components? It seems like this scenario should be fairly common and there's probably a correct way to approach this. I just haven't come across it yet. I have just installed Resharper 6 and am now getting this problem. Note: Just tried a non COM project and everything works as expected.